Dr. Sidney Flowers created an induction that’s famous among hypnotists. 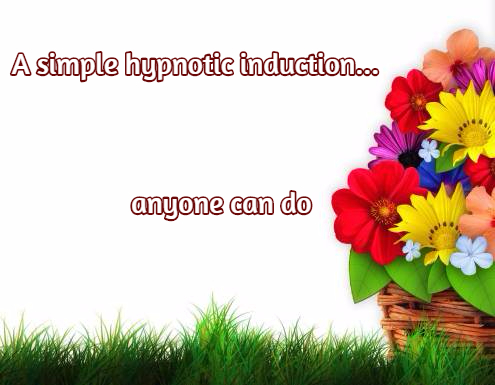 It’s called the Flowers induction, it’s easy to do and works pretty well most of the time. There are various versions of this induction type out there. Here’s a nice one, big picture first. You can do eye fixation different ways. I like to have folks pick a spot on the opposite wall and have them expand their awareness outward so that they’re looking in the direction of the spot but not at it. Or, you just have them pick a spot and suggest that they’ll focus on that spot until their eyes become tired and close. A third alternative is to have them engage their imaginations. Look at the wall opposite you as if you’re dreaming. Look through the wall and see a nice, comforting scene. In a moment, you’ll find all your muscles relaxing. Your face will relax, your shoulders will relax, your arms and legs relax and your whole body lets go. Soon, you close your eyes and go into a deep, peaceful hypnotic rest. Soon, I’m going to count from one to twenty. On each number, you’ll close your eyes. In between numbers, you may open your eyes. Sometime before I reach the count of 20, you’ll just close your eyes and go into a calm, tranquil hypnotic rest. Maybe at the count of 15, 10 or even 5, you go into a deep, peaceful hypnotic rest. Your eyes will just get so relaxed that it will be more comfortable to leave them closed. At this point, either demonstrate the count/eyes closing or ask the client to do it for a few numbers, so you know they understand the instructions. Even after they stop opening their eyes, continue the count all the way, adding suggestions that they’re relaxing completely and experiencing a nice hypnotic trance. That’s the Flowers induction — add it to your toolbox!